Had a brilliant night here on a Thursday with Griff doing karaoke. Good times. 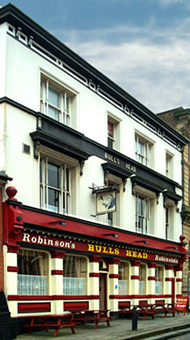 Incidently...The photo on show today 10/6/08 is NOT the Bulls Head,High Lane...but the Bulls Head on Stockport market place. Visited this pub in March 2008.The Boddingtons was on top form,and the bar staff and locals chatty. It's only a small pub but has huge potential,situated adjacent to the Macclesfield canal. The place could do with a bit of redecorating to freshen it up a bit.